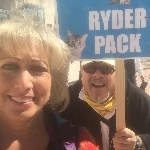 Thank you for visiting my Personal Fundraising Page for 2019 Walk for the Animals - Ryder Pack. It's that time of the year again - 2019 Walk for the Animals - and I'm asking for donations! Please help all our furry friends at the Humane Society of Greater Miami.